NOTE: I now feel differently about some of the things I wrote in this blog, but I have not yet had the time to edit it. Therefore, as always, please take this information with a grain of salt and pray for the Holy Spirit to lead you to truth. And one of the elders answered, saying unto me, "What are these which are arrayed in white robes? and whence came they?" And I said unto him, "Sir, thou knowest." And he said to me, "These are they which came out of great tribulation, and have washed their robes, and made them white in the blood of the Lamb." 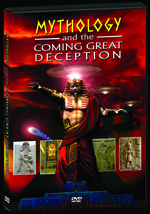 There are 22 chapters in the Book of Revelation that tell the full story of the End of Days. But at this point, the story was just beginning when all of a sudden John sees those who came out of the great tribulation! It's even written in past tense! That's just one of many examples that seems to clearly illustrate that this is a very non-linear book and thus indicates that it should be understood as such. Therefore, the way we can piece together the order of events is by comparing Scripture with Scripture - both in the Book of Revelation itself as well as with confirming Scriptures elsewhere in the Bible. And that's exactly what I am going to attempt to do here. 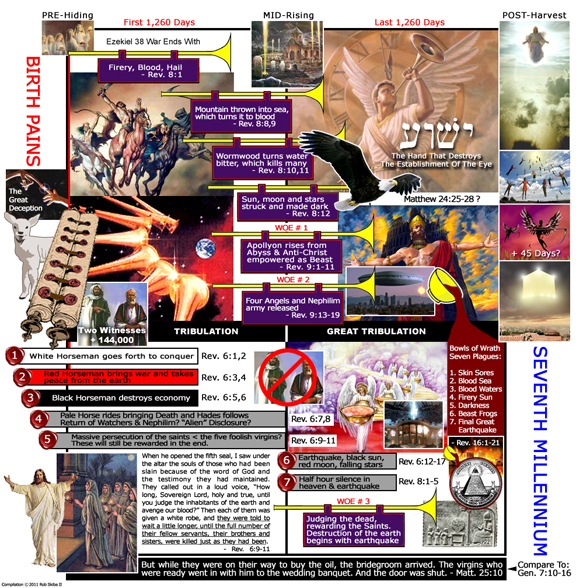 There is another problem with most pictorial renditions of the Tribulation: to my knowledge no one has ever drawn up a timeline with the Nephilim in mind! When you do, everything changes! Therefore, I have decided to make possibly the first Tribulation Timeline that includes the Nephilim for your consideration! 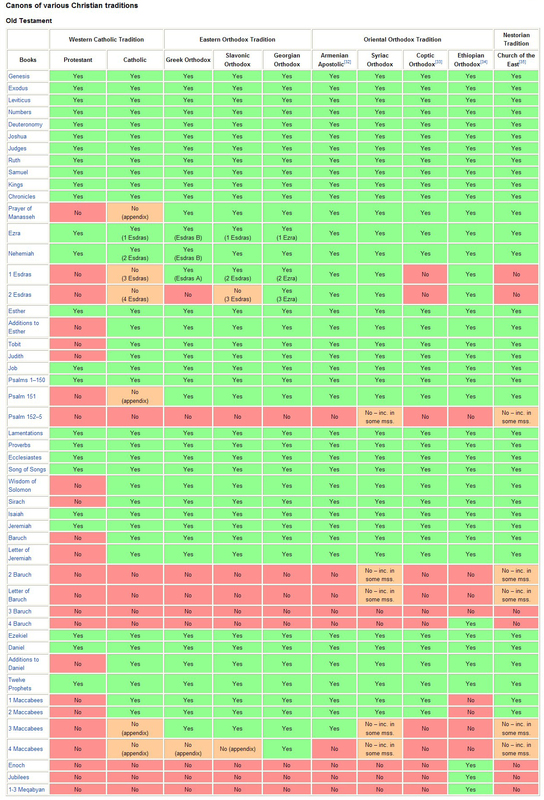 You can click on the image below to enlarge it in another browser and reference as you continue to read this blog. 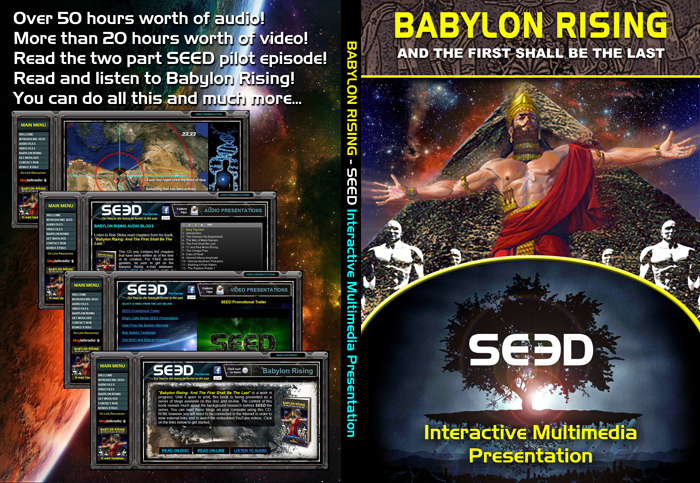 Reading the Book of Revelation and cross-referencing the listed events with those given in the Olivet Discourse, the books of Exodus, the Psalms, Isaiah, Ezekiel, Daniel, Joel, Amos, Zephaniah and Zechariah, while keeping the "days of Noah" in mind (i.e. including the Watchers and Nephilim in the mix), this is what I came up with. Now let me see if I can explain it for you. As I do, I ask that you pray to see if the Holy Spirit bears witnesses. This is the first time I've ever looked at the Last Days in a timeline format with an understanding of the Nephilim. Therefore, I do not claim that this is the absolute truth. It is merely a theory put into picture format. This blog will describe what I believe it all means. Looking at the beginning of Revelation, we see that the first four chapters essentially set the stage. They deal with letters to the Seven Churches and then we are given an introduction to Heaven and to the Lamb of God who "was and is and is to come." This Lamb is the only One found worthy to open the scroll that is sealed with Seven Seals. The first thing that occurred to me regarding that scroll is that it could be the rest of the "revelation" that was given to Daniel by Yeshua that he was told to "seal up" until the end. He replied, “Go your way, Daniel, because the words are rolled up and sealed until the time of the end. 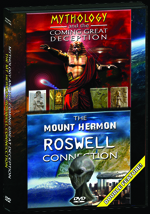 My timeline graphic starts with Revelation chapter 6. Now before I continue, it will be important to put aside all preconceived notions of eschatology. We all have them. Keep them in the back of your mind for now. Let this thesis speak for itself, then decide whether or not it makes sense to you and more importantly that it is supported by Scripture with the Holy Spirit bearing witness. Too often we try to make Scripture fit our preconceived ideas. I've been guilty of that too. In fact, for nearly 33 years I did that with my closely held belief in the Pre-Tribulation Rapture view. But when I let Scripture speak for itself, my views on many things concerning the Last Days started to change. As stated in The Rapture Riddle blog, those who believe in a Pre-Tribulation Rapture assume (< key word) that because the book starts off talking about the Church, and then there is no mention of it after John gets called up to Heaven in chapter 4, that this essentially gives "proof" of the Rapture. There is absolutely nothing in the text that indicates that idea is true. It is merely an assumption. If you can acknowledge that, what I'm about to say next will make more sense. If not, you might as well stop reading this blog now and go curl up to cozy reading of your favorite Tim LaHaye book. One immediate observation I had as I read Revelation chapters 5 and 6, is that there is nothing at all in the text that says or otherwise indicates that the Seven Seal Judgments all have to take place within The Seven Year Tribulation Period. An equally valid assumption is that they could begin before The Seven Year Tribulation Period as the "birth pangs" that Yeshua referred to in His Olivet Discourse. White Horse - (white usually represents purity) its rider wears a crown and holds a bow (but no arrows) going forth to conquer. Red Horse - its rider has a big sword and is given power to make war and take peace from the earth. Black Horse - its rider holds scales and has the power to destroy the economy. Pale Horse - its rider is Death and Hades follows "close behind him." 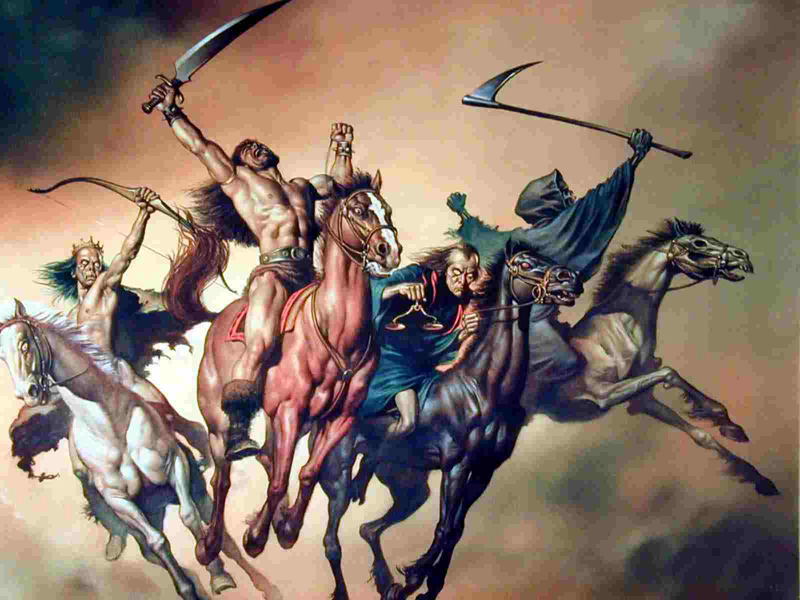 I believe the first four Seals of Revelation 6:1-8 have already been opened and the fourth horse began to ride this year with all of the death and destruction we have seen since December 21, 2010. Never in the history of the world has there been so many devastating earthquakes, bizarre, destructive weather and strange things like massive (breed specific) bird and fish die-offs as well as riots and wars - all happening at the same time in increasing measure. Does that mean we have entered The Seven Year Tribulation Period? I don't know, but I would lean toward saying, "no" because I believe both the wars of Psalm 83 and Ezekiel 38-39 (which is a war that will require seven years to clean up the mess) must come first. The way things are going with Israel and the Middle East these days, it seems like both wars could happen any day now, but so far - at least as of the time of this writing - they have not. We also haven't seen evidence of the Two Witnesses yet (at least not that I am aware of). 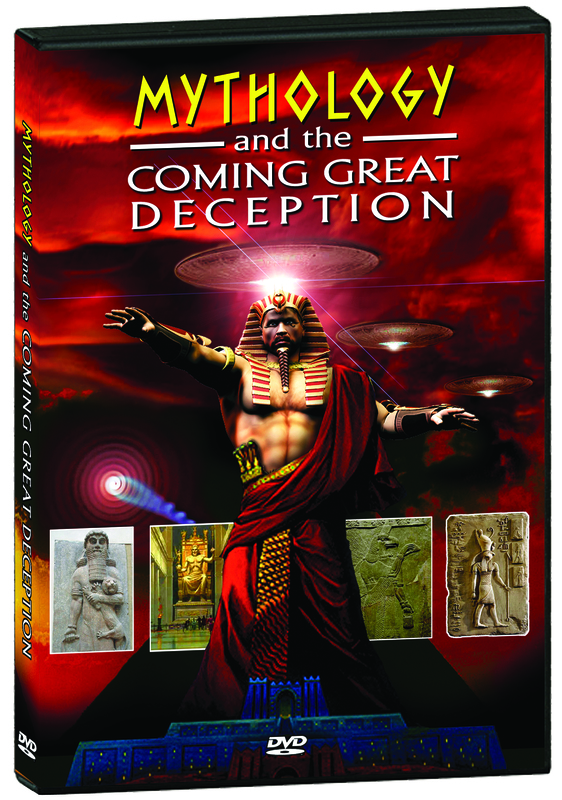 Although, one of my readers posed the question, "What if the 'UFO' that descendend over the Temple Mount on January 28th, 2011 represented the Two Witnesses being 'dropped off' in Jerusalem?" Again, I don't know, but I find that an intriguing question indeed! I guess we will have to keep watching and waiting for news to develop on that story. There is also the strange statement President Obama made concerning his second 100 days in office, stating that he would complete them in 72 days and rest on the 73rd - which just so happened to mark the beginning of a 1,260 day countdown leading up to December 21, 2012. I do find all of that to be rather curious and even disturbing. Again, I guess we shall wait and see. At any rate, as stated above, I believe it is at least possible that the first four Seals will precede and actually herald the 70th Week of Daniel as the "birth pains" that Yeshua talked about. That passage seems to indicate the riding of the Four Horsemen. I believe the opening of the Fifth Seal either happens just prior to or in fact marks the beginning of the Tribulation Period. Compare what John says in the Book of Revelation with what Yeshua said in His Olivet Discourse. “Then you will be handed over to be persecuted and put to death, and you will be hated by all nations because of me. At that time many will turn away from the faith and will betray and hate each other, and many false prophets will appear and deceive many people. Because of the increase of wickedness, the love of most will grow cold, but the one who stands firm to the end will be saved. And this gospel of the kingdom will be preached in the whole world as a testimony to all nations, and then the end will come." I believe that the part where Yeshua mentions many false prophets who will "appear" and deceive many may reference full Alien Disclosure - the moment when "E.T." finally shows up in mass as our creators, our saviors and prophets. I'll address this more in The Coming Great Deception blog (coming soon... in more ways than one). At that point, everything will change and Christianity will be viewed as irrelevant, false and possibly dangerous to this new revelation. Many will be killed. Thus, in The Rapture Riddle thesis, I can see a Pre-Tribulation Exodus for those who are "wise" and prepared like the five virgins who were ready when their groom returned. I can see those faithful and obedient Saints who watched and waited, knowing the signs and the seasons, being the ones dwelling in a place of safety right from the start. Meanwhile, the other Saints who were not prepared will have to take a stand for truth, having to go through the Tribulation. Perhaps as they are obedient, they too may enter the place of safety (Zeph. 2:3). But it seems to me that they may end up being those who will be greatly honored as the Tribulation Martyrs (Rev. 6:9-11, Rev. 14:13). At any rate, looking at the descriptions of the Seven Trumpet Judgments, I believe you have to put at least the first five into the first half of the Tribulation Period based on what happens at the Fifth Trumpet. The first four Trumpets involved stuff falling from the sky causing all sorts of pain, death and destruction on the planet. And I think perhaps the Sixth Seal matches up with the Fourth Trumpet, possibly happening around the same time. I watched as the Lamb broke the sixth seal, and there was a great earthquake. The sun became as dark as black cloth, and the moon became as red as blood. Then the stars of the sky fell to the earth like green figs falling from a tree shaken by a strong wind. The sky was rolled up like a scroll, and all of the mountains and islands were moved from their places. 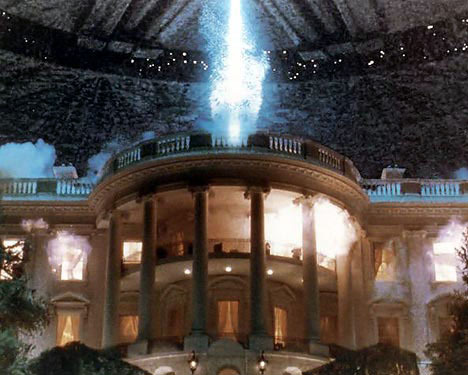 With all that stuff falling out of the sky and impacting the earth, that will certainly not be a good time for those still living here! But still, during all of that the 144,000 virgin male Jews are doing stuff as are the Two Witnesses. In fact, as I pointed out in The Rapture Riddle blog, they are the ones who apparently have the power to actually make such things happen! And I will appoint my two witnesses, and they will prophesy for 1,260 days, clothed in sackcloth. 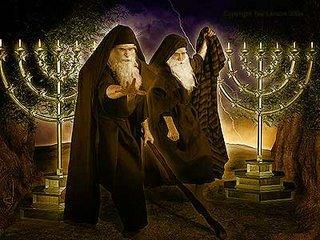 They are the two olive trees and the two lamp stands, and they stand before the Lord of the earth. If anyone tries to harm them, fire comes from their mouths and devours their enemies. This is how anyone who wants to harm them must die. They have power to shut up the heavens so that it will not rain during the time they are prophesying; and they have power to turn the waters into blood and to strike the earth with every kind of plague as often as they want. But this power will only last until the Fifth Trumpet sounds. The fifth angel sounded his trumpet, and I saw a star that had fallen from the sky to the earth. [Third Trumpet - Wormwood?] The star was given the key to the shaft of the Abyss. When he opened the Abyss, smoke rose from it like the smoke from a gigantic furnace. The sun and sky were darkened by the smoke from the Abyss. [Fourth Trumpet - Darkness?] And out of the smoke locusts came down on the earth and were given power like that of scorpions of the earth. They were told not to harm the grass of the earth or any plant or tree, but only those people who did not have the seal of God on their foreheads. They were not allowed to kill them but only to torture them for five months. And the agony they suffered was like that of the sting of a scorpion when it strikes. During those days people will seek death but will not find it; they will long to die, but death will elude them. The locusts looked like horses prepared for battle. On their heads they wore something like crowns of gold, and their faces resembled human faces. Their hair was like women’s hair, and their teeth were like lions’ teeth. They had breastplates like breastplates of iron, and the sound of their wings was like the thundering of many horses and chariots rushing into battle. They had tails with stingers, like scorpions, and in their tails they had power to torment people for five months. They had as king over them the angel of the Abyss, whose name in Hebrew is Abaddon and in Greek is Apollyon (that is, Destroyer). There is a LOT going on in that passage! The first few verses appear to reference similar things as that which came upon the earth in the third and fourth Trumpet Judgments. But the primary result of the Fifth Trumpet is a release of Nephilim creatures with Apollyon as their leader. You can not deny that these are strange and terrifying indeed. I believe we should simply take the Scriptures literally. If we do, we can see the beginning of some really bad times ahead. Notice also that after the Fourth Trumpet blows an eagle flies and announces that the next three Trumpets are "Woes." This video by the band, 30 Seconds to Mars absolutely illustrates the Fifth and Sixth Trumpets. 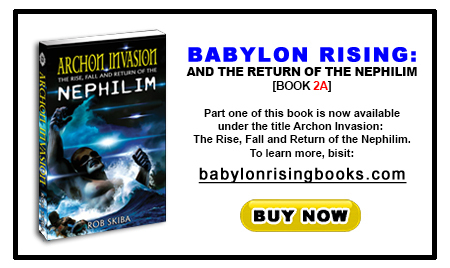 It is totally about the return of the Nephilim. It even starts with the shriek of an eagle! Note also the lead singer's name - Jared Leto. It was in the days of Jared that the Fallen came to earth and in Greek mythology, Leto was the wife of Zeus who gave birth to Apollo! This video depicts giants, hybrids and the return to life of one who receives a head wound. There is a scene depicting a cross at that point and that is where Leto screams, "The age of man is over." as a white horse rides down the street. CLICK HERE for the lyrics. "Behold, I have told you before. Wherefore if they shall say unto you, Behold, he is in the desert; go not forth: behold, he is in the secret chambers; believe it not. For as the lightning cometh out of the east, and shineth even unto the west; so shall also the coming of the Son of man be. For wheresoever the carcase is, there will the eagles be gathered together." This tells us a couple of things. First, why would Yeshua even bother letting us know about this if none of us were going to be around to know about it - assuming everyone gets zapped out in a Pre-Tribulation Rapture? Second, what we see here are eagles gathered around a carcase that apparently made its way into a "secret chamber" after being in the desert! 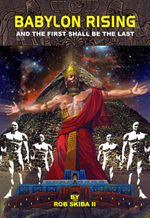 I believe this statement by Yeshua concerning the body of Gilgamesh-Osiris-Nimrod is a depiction of the moments immediately preceding the Fifth Trumpet. And thus, we have an eagle taking flight and screaming, "Woe! Woe! Woe!" - in other words, "What's about to happen next is not good folks! Things are about to get really bad, really quick. Frankenrod is about to rise from the dead!" The scriptures tell us that in the Greek, this angel [of Revelation 9:11] goes by the name of Apollyon. Apollyon is the Greek god Apollo. According to Webster's, Apollyon is a common misspelling of Apollo. The name is Greek for "Destroyer" (Απολλυων, from απολλυειν, to destroy). It also echoes the unrelated Hebrew Abaddon (lit. "place of destruction," but here personified) and the name of the Greek god Apollo, also a "destroyer" in his aspect of controlling pestilence, though the composite monstrosity that is Apollyon is distinctly Babylonian and Persian, not Hellenic, in inspiration. In Hellenistic theology, Apollo is generally depicted as a very benevolent god, representative of poetry, music and the arts. However, he is also known as the sender and stayer of pestilence. As a son of Zeus this would certainly fit - especially if my thesis is true that Zeus is Lucifer - a being who loves to appear as an angel of light and goodness, but in fact is the harbinger of plague, pestilence and death. 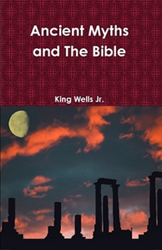 Considering the fact that the Fifth Trumpet releases the plague of locusts (which is certainly a pestilence), the idea that Apollo (Apollyon) is directly referred to as "the king [that rules] over them" truly fits! Thus, Apollo will have the key to the shaft of the bottomless pit and return with a horde of demonic warriors who have been bound in the Abyss for centuries. Rudolf Steiner, the author of "Egyptian Myths and Mysteries," written in 1908, states that the Greeks realized that the Egyptian god Osiris is the same as the Greek god Apollo. The Greeks experienced this also, and as they became acquanted with the Egyptian mysteries they recognized that Osiris was the same as the god whom they called Apollo. They said that the Egyptian Osiris was Apollo, and that, like Osiris, Apollo worked upon the nerves so as to achieve a soul-life within man. The Anti-Christ is the return of Apollo/Osiris and probably the return of other prophesied gods, such as Quetzacoatl of the Mayans and Baal of the Canaanites. Both of which are sky gods like Apollo. The Fifth Trumpet blows, and the spirit of Apollyon (Apollo) ascends back into its former host body - Nimrod. Thus, empowered by the dragon himself, the Anti-Christ will rise. And his first order of business will be to kill the Two Witnesses! And when they [the Two Witnesses] shall have finished their testimony, the beast that ascendeth out of the bottomless pit shall make war against them, and shall overcome them, and kill them. And you know what is holding him [Anti-Christ] back, for he can be revealed only when his time comes. For this lawlessness is already at work secretly, and it will remain secret until the one who is holding it back steps out of the way. Apollyon is only able to rise after Michael has removed himself from the playing field. A lot of people who believe in the Pre-Tribulation Rapture view like to say that the restrainer is the Holy Spirit empowered Church. They will say that the Rapture of the Church removes the power of the Holy Spirit from the earth and that is what allows the Anti-Christ to rise in power. First of all, as seen above, I believe the Scriptures themselves reveal that it is Michael and not the Holy Spirit that is being discussed here. Second, the idea that the Church is somehow so powerful as to not "allow the Anti-Christ" to rise is completely ludicrous and not based in Scripture either. In fact, as I've already stated in The Rapture Riddle blog, I believe that view totally contradicts itself! The spirit of Anti-Christ has been around since the time of Christ! But many will argue that his work has been restrained because of the Church. I might be inclined to believe that if it weren't for the striking lack of evidence for such a powerful Church... especially in our day! Did Yeshua give us the victory? Yes. Did he give us His power and authority? Yes. But how many Christians do you know who are sick and dying of all sorts of disease? If we can't cure the common cold, how are we to hope we'll have the power to combat the Beast and his Nephilim armies - "restraining" them?? I know Christians who talk a big game but scream in terror at the sight of a spider! Please. Further, Paul described a great "falling away" in the Last Days. This shows anything but a powerful, Holy Spirit filled Church! It shows a Church whose elect have likely been deceived! 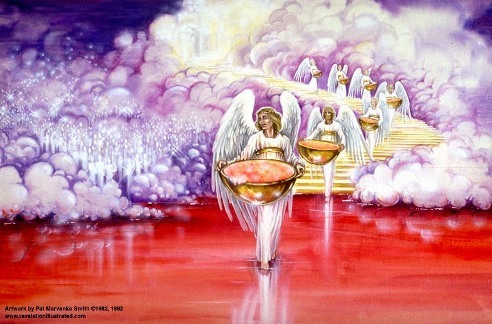 Michael - the restrainer - steps out of the way and immediately after that, the Fifth Trumpet blows. Is this when CERN's experiments finally pay off? Is this when Lord Shiva (the Destroyer) finally does his dance and Apollyon (the Destroyer) rises? It's certainly starting to look like it! The Two Witnesses lay dead for 3.5 days and the world celebrates in a very familiar fashion! What's 3.5 days after December 21st? It is CHIRSTMAS DAY - the birthday of the Anti-Christ!! The day the whole world "makes merry and sends gifts one to another!" I used to believe this would be the order of events, but after writing The Rapture Riddle, I realized that the Two Witnesses are more likely going to be killed during the Spring Feasts, probably around the same time that Yeshua was crucified. I find both possibilities equally intriguing. Regardless of when the Two Witnesses are killed, I believe it is at the this point that Yeshua basically says, "Enough is enough! No more! Come on up guys! I don't want you to have to deal with what's coming next." Then they heard a loud voice from heaven saying to them, “Come up here.” And they went up to heaven in a cloud, while their enemies looked on. Once the Beast comes to power and kills the Two Witnesses, God raises them and prepares to destroy the Beast and all who follow him. Whether the Sixth Trumpet is blown before or after the killing and resurrection of the Two Witnesses, I am not sure. I personally believe the Sixth Trumpet is sounded very close to the time that the Fifth Trumpet is sounded - followed by the Seventh Trumpet very shortly thereafter. The final three "Woes" appear to be announced quite close to one another. At any rate, when the Sixth Trumpet sounds, I believe this is where we see the fulfillment of Enoch's prophecy concerning the Last Days and the return of the Watchers and their Nephilim offspring! And when their sons have slain one another, and they [the Watchers] have seen the destruction of their beloved ones, bind them fast for seventy generations in the valleys of the earth, till the day of their judgment and of their consummation, till the judgment that is for ever and ever is consummated. Then the sixth angel blew his trumpet, and I heard a voice speaking from the four horns of the gold altar that stands in the presence of God. And the voice said to the sixth angel who held the trumpet, “Release the four angels who are bound at the great Euphrates River.” Then the four angels who had been prepared for this hour and day and month and year were turned loose to kill one-third of all the people on earth. I heard the size of their army, which was 200 million mounted troops. Sound the alarm in Jerusalem! Raise the battle cry on my holy mountain! Let everyone tremble in fear because the day of the Lord is upon us. It is a day of darkness and gloom, a day of thick clouds and deep blackness. Suddenly, like dawn spreading across the mountains, a great and mighty army appears. Nothing like it has been seen before or will ever be seen again. Fire burns in front of them, and flames follow after them. Ahead of them the land lies as beautiful as the Garden of Eden. Behind them is nothing but desolation; not one thing escapes.They look like horses; they charge forward like warhorses. Look at them as they leap along the mountaintops. Listen to the noise they make—like the rumbling of chariots, like the roar of fire sweeping across a field of stubble, or like a mighty army moving into battle. Fear grips all the people; every face grows pale with terror. And in my vision, I saw the horses and the riders sitting on them.The riders wore armor that was fiery red and dark blue and yellow. The horses had heads like lions, and fire and smoke and burning sulfur billowed from their mouths. One-third of all the people on earth were killed by these three plagues—by the fire and smoke and burning sulfur that came from the mouths of the horses. Their power was in their mouths and in their tails. For their tails had heads like snakes, with the power to injure people. Joel 1 describes a plague of locusts. 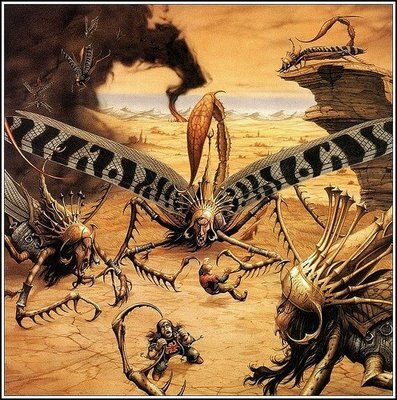 Thus, many have noticed the depiction of the creatures in Joel 2 is very similar and have therefore described this "Joel 2 Army" as a "Locust Army." I find it interesting that John's depiction of the creatures realeased at the Fifth Trumpet describes a plague of demonic locusts rising from the Abyss - just like Joel 1. The creatures then described at the Sixth Trumpet are virtually identical to those described in Joel 2! These parallels are far too perfect to ignore! Joel and John are seeing and describing the exact same thing! It is shocking to know that there is actually a growing number of Christians who believe that they are "Joel's Army" and that they will have dominion over those who reject the Messiah! Folks, read the two Scriptures above again and look at the picture to the right. Does that look and sound like God's people?? No. These are horrible, Nephilim hybrid monsters! They forget that God often causes the nations and evil kings to execute judgment all through the Bible. He constantly uses people like the Pharaoh of Egypt and Nebuchadnezzar of Babylon to do His will. But Dominionists twist this passage to believe that they are Joel's Army. They teach a doctrine not at all unlike the ideology of the Crusaders and the Nazis - that we need to take the world by force through violence. That is NOT Biblical Christianity! That is NOT Christ-like! We need to run far away from this "New Breed-Latter Rain" ideology and warn our brothers and sisters in Christ who have gotten sucked into this heresy! And you may be surprised who has gotten involved with this - people like: Sarah Palin, Rick Joyner, Rick Warren, among other prominent people in the Body of Christ! What is even more extraordinary is the seemingly intentional release of the locusts that appears to be in the works at the University of Cambridge! Watch the following video (that was recently sent to us from one of my readers) concerning the "Corpus Clock" and listen carefully to the final words of Dr. John C. Taylor. The video starts in darkness with the ticking of a clock. Then, you hear the rattling of chains three times and then the scene is illuminated! Dr. Taylor walks on and announces that the clock "just struck three." As the video progresses, look at the way the locust that is running the clock is depicted! That is not a normal locust! 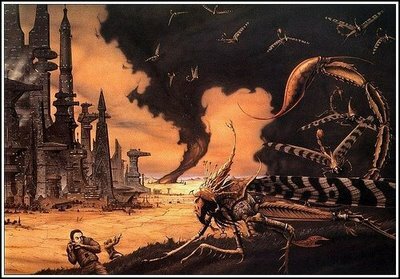 That is a Joel-Revelation stylized locust! Notice also how the "clock is ticking" throughout the entire video. It stops at 3:30 on the video's timeline when Dr. Taylor says, "The time is 11 o'clock precisely." Then he turns and smiles at the camera and describes the "illuminated bank of LED's" that only uses 60 watts. The clock continues ticking and his final statement is, "I would be delighted if you would accept my invitation to come to the inauguration (the beginning of a term of leadership) of the Corpus Clock (the Body Clock) and celebrate the release of the chronophage and relative time onto the unsuspecting citizens of Cambridge." Finally, notice at the end of that statement you hear the sound of rattling chains three times again!! That is nothing short of shocking and quite terrifying if my suspicions are correct! Folks, the bottom line is the locusts are EVIL! And you're not going to want to be around when Joel's Army is released at the sound of the Fifth and Sixth Trumpets as noted in the Book of Revelation! I think that if you look at that list, it is easy to see and agree that they each do indeed have a tremendous influence on our culture. So, the premise is, what if we as Believers could position ourselves in each of those spheres of influence such that the message of the Kingdom can be made known through them? Imagine if our Education system had Believers in it that could teach young people the truth of God's Word instead of the lie of Evolution and other harmful, Satanic ideologies. Imagine if the Arts brought glory to God and the Media could be used to declare Truth rather than lies. Imagine if Religion were used to show the love of God rather than as a tool for control and manipulation. Imagine if the Family got its values from the Bible rather than Oprah and Jerry Springer! Imagine if Business was run by Godly men and women who practiced Biblical, ethical principles rather than those based on greed and selfishness. Imagine a Government run by Godly men and women as opposed to the Luciferian, Illuminati Elite that run it now. I think you get the idea. Essentially, I believe this concept asks the question, "What if God's people were actually culturally relevant instead of always on the defense?" This is not an ideology promoting Dominionism, whose goal is to RULE the world through a perverted understanding of "Joel's End Time Army." Rather, it is a concept designed to show us how much more effective we could be at REACHING people with the love of God and the Truth that sets men free. 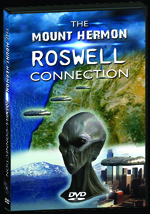 In its purist form, I believe the Seven Mountain Prophecy is about REACHING not RULING. The Devil has always made a point of twisting truth into lies. He did it in the Garden. He did it in the wilderness with Yeshua. He has done it all through the centuries. Assuming this Seven Mountain Prophecy concept is legitimate, imagine how powerful it could be! 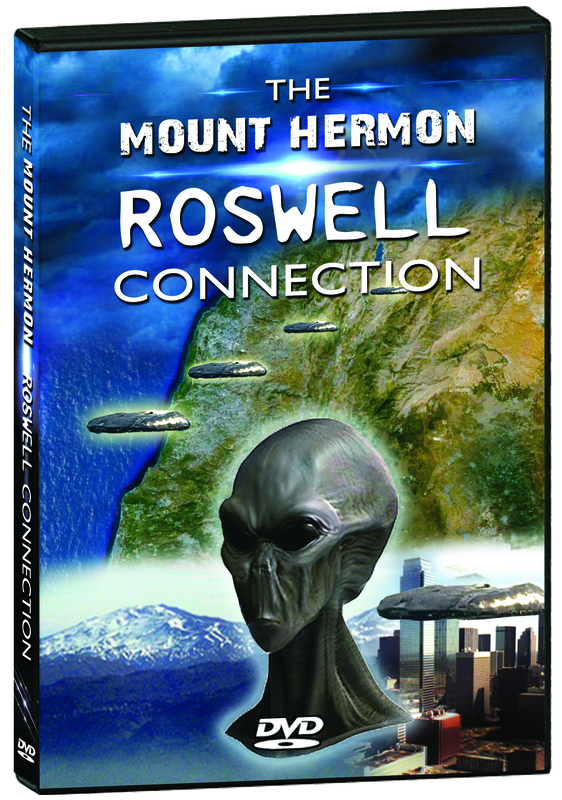 The Devil knows this - because he and his demonic hordes currently occupy those mountains. So, what better way to get Christians to forsake the whole idea than to use Christians to twist and pervert it into something it is not? Next thing you know, everyone is preaching against the very thing that could reach the nations! I could be wrong, but this is exactly what I believe is happening with this whole Seven Mountain controversy. 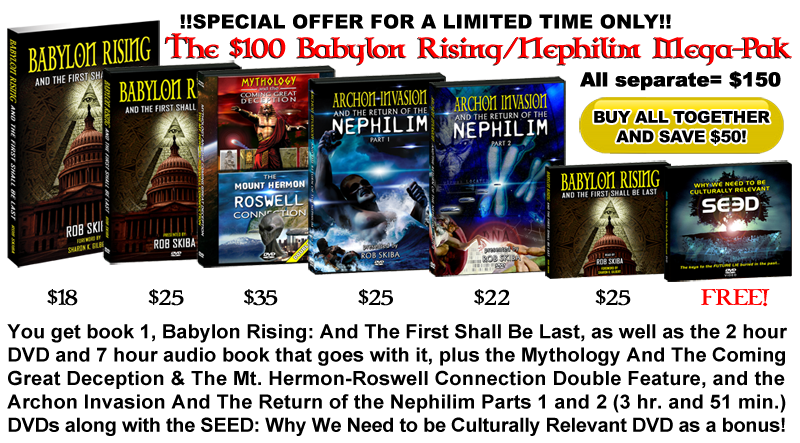 With the release of these Nephilim hybrids, all hell will be unleashed on earth - literally. And God prepares to pour out his wrath upon them once and for all! The Seventh Seal is broken and there is silence in Heaven for the space of a half hour. What is that about? I don't know. I think because there is eager anticipation concerning what God is going to do with the earth that is now completely full of Nephilim (as it was in the days of Noah)! The Seventh Seal seems to line up with the Seventh Trumpet. Then another angel with a gold incense burner came and stood at the altar. And a great amount of incense was given to him to mix with the prayers of God’s people as an offering on the gold altar before the throne. The smoke of the incense, mixed with the prayers of God’s holy people, ascended up to God from the altar where the angel had poured them out. Then the angel filled the incense burner with fire from the altar and threw it down upon the earth; and thunder crashed, lightning flashed, and there was a terrible earthquake. Then, in heaven, the Temple of God was opened and the Ark of his covenant could be seen inside the Temple. Lightning flashed, thunder crashed and roared, and there was an earthquake and a terrible hailstorm. I believe that the Seventh Trumpet is sounded at the moment the Anti-Christ seats himself in the Holy of Holies of the Third Temple. Imagine the scene. Nimrod has arisen. He killed the Two Witnesses. Then, he decides to walk into the Temple and declare himself God. How does he do that? Well, it appears that with this new Temple, the Ark of the Covenant has been returned to its old position in the Holy of Holies. The Ark was not just a chest to contain things, it was a seat - the Mercy Seat - the place where God Himself came down to earth and sat. I believe Nimrod is going to sit on the Ark of the Covenant to prove to all that he is God! That makes God really angry!! I believe the massive earthquake literally knocks Nimrod off the Ark! Everything about the Temple on earth was a mirror of the Temple in Heaven. And I think that's why attention is given to its Heavenly counterpart during the Seventh Trumpet description above. Then I looked and saw that the Temple in heaven, God’s Tabernacle, was thrown wide open. The seven angels who were holding the seven plagues came out of the Temple. They were clothed in spotless white linen with gold sashes across their chests. Then one of the four living beings handed each of the seven angels a gold bowl filled with the wrath of God, who lives forever and ever. The Temple was filled with smoke from God’s glory and power. No one could enter the Temple until the seven angels had completed pouring out the seven plagues. Nimrod and all his hordes - both human and otherwise are about to pay dearly for their rebellion! 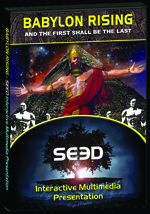 The Bowl Plagues are virtually identical to the plagues that God poured out on Egypt. And the results will be the same. The gods will be utterly destroyed and God will reign supreme! In that day the Lord will punish the gods in the heavens and the proud rulers of the nations on earth. They will be rounded up and put in prison. They will be shut up in prison and will finally be punished. Then the glory of the moon will wane, and the brightness of the sun will fade, for the Lord of Heaven’s Armies will rule on Mount Zion. He will rule in great glory in Jerusalem, in the sight of all the leaders of his people. “The [Anti-Christ] king will do as he pleases, exalting himself and claiming to be greater than every god, even blaspheming the God of gods. He will succeed, but only until the time of wrath is completed. For what has been determined will surely take place. 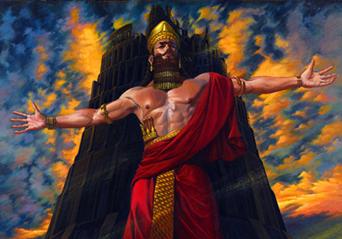 He will have no respect for the gods of his ancestors, or for the god loved by women, or for any other god, for he will boast that he is greater than them all. Instead of these, he will worship the god of fortresses — a god his ancestors never knew — and lavish on him gold, silver, precious stones, and expensive gifts. 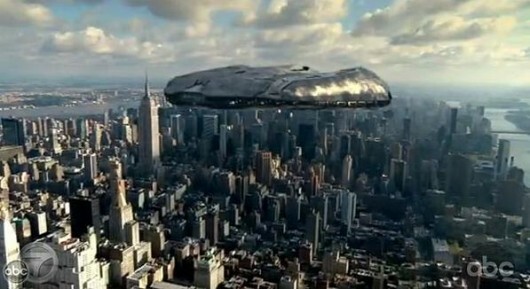 Note: I can't help but wonder if this "god of fortresses" is not the leader of an "alien" invasion force of motherships (fortresses) that will surround the earth, much like what we have seen in shows like,"V" and the movie, "Independence Day." “Then at the time of the end, the king of the south will attack the king of the north. The king of the north will storm out with chariots, charioteers, and a vast navy. He will invade various lands and sweep through them like a flood. He will enter the glorious land of Israel, and many nations will fall, but Moab, Edom, and the best part of Ammon will escape. He will conquer many countries, and even Egypt will not escape. He will gain control over the gold, silver, and treasures of Egypt, and the Libyans and Ethiopians will be his servants. “But then news from the east and the north will alarm him, and he will set out in great anger to destroy and obliterate many. He will stop between the glorious holy mountain and the sea and will pitch his royal tents. But while he is there, his time will suddenly run out, and no one will help him. That looks to me like a global, civil war within the Anti-Christ's One World Order. If so, not only is God waging war on those left on the earth, but apparently they are warring amongst themselves too! And no wonder. 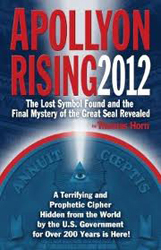 Remember, the Fifth and Sixth Trumpets released the "Nephilim kings" and beasts of the ancient world. Also, consider this: the Watchers were presumably told to do what they did in The Genesis Six Experiment by Lucifer. And as we learned in the Building a Pure Nation blog, they paid dearly for it and will for all eternity. I imagine they will want revenge. So, Lucifer and his unholy Anti-Christ and False Prophet find themselves facing total destruction from every angle! God's war against the gods is about to finally come to a terrible end (for them). In the Reasons to be ConCERNed blog, I mentioned exactly why I believe God has to once again destroy the world as He did in the days of Noah. But before He does that, He has to get rid of the gods and those who follow them once and for all. And this is exactly what we see as the events in the Book of Revelation begin to come to a close. Then I saw the beast and the kings of the world and their armies gathered together to fight against the one sitting on the horse and his army. And the beast was captured, and with him the false prophet who did mighty miracles on behalf of the beast—miracles that deceived all who had accepted the mark of the beast and who worshiped his statue. Both the beast and his false prophet were thrown alive into the fiery lake of burning sulfur. Their entire army was killed by the sharp sword that came from the mouth of the one riding the white horse. And the vultures all gorged themselves on the dead bodies. This marks the end of The End. 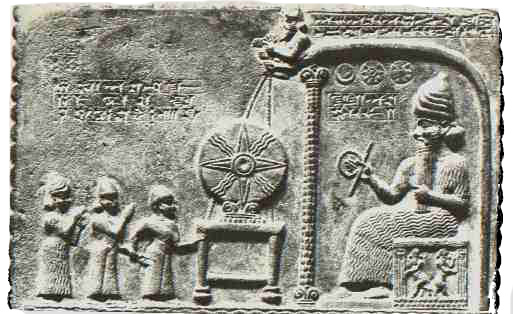 Babylon falls and the Great Prostitute with it. The Rider on a white horse who is called Faithful and True wages war against the Beast and False Prophet, casting them alive into the Lake of Fire. The sword that comes out of his mouth slays the rest. Finally, the Serpent is bound and cast into the Abyss for a thousand years. Thus, begins the Seventh Millennium. Many Christians believe that they are Joel's Army. And many of them are following people who promote a belief in Dominionism. They twist the Lord's command to "go and make disciples of all nations" into a "Kingdom Now" mentality, whereby we take the world by force in order to hand it to Him when He returns so that He can rule and reign for a thousand years. The leaders of "Joel's Army" are called "Generals." There are several of them----Paul Cain, Bob Jones, Todd Bentley, Jack Deere, Mike Bickle, Rick Warren, Morris Curillo, Peter Wagner, Brandon Barthrop, Sam Fife, TD Jakes, Rick Pino, Cindy Jacobs, Rodney Howard Brown, Patricia King, Bill Burns, JoAnn Mc, Fatter, Mary K. Baxter, John Crowder, Jill Austin, Stacey Campbell-Wesley, Michael Krysty, John Siefker--and the list of "generals" keeps growing around the world, with some of them comparing their movement with Hitler's regime. The troops of Christians are called frontline warriors, green berets, and other military tags. Yet Rick Joyner has publicly stated that the warfare is not only spiritual, but natural. Here lies the trouble. Jesus made it plain that His kingdom is "not of this world." His people are not even citizens of this world but "sojourners." When He comes back to take over the kingdoms of this world, that is what He will do, along with the resurrected and glorified saints. However, Joel's Army generals claim that they will take over the nations, and "give them to Jesus." That is the crucial error in their teaching. The Joel's Army people believe that Jesus is going to make them superhuman BEFORE He returns. They are blind, egotistical fools. 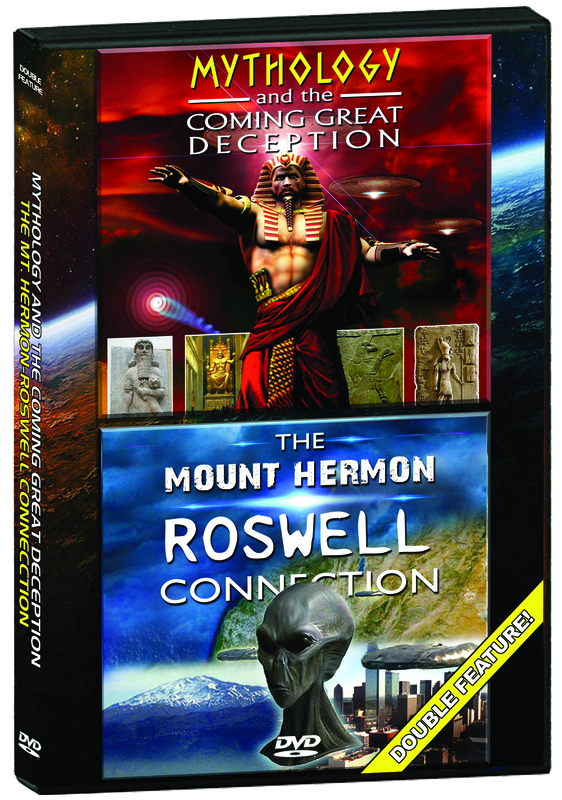 Many have asked me what my position is on what has become known as The Seven Mountain Prophecy. I could be wrong about this, but at present, I believe the concept is valid and in fact of God. But I believe it has been usurped by the Devil and perverted by the Dominionist movement into something it was never meant to be. My understanding of this concept is that it originated with Bill Bright, Francis Shaeffer and Lauren Cunningham - all well respected men in the Body of Christ, who have each done great things to advance the Kingdom of God, through His Word and through acts of love and kindness. There are many subgroups under these main categories. About a month later the Lord showed Francis Schaeffer the same thing. In essence, God was telling these three change agents where the battlefield was. It was here where culture would be won or lost. Their assignment was to raise up change agents to scale the mountains and to help a new generation of change agents understand the larger story. This website is designed to help educate those who wish to become change agents in culture for Christian values and to connect like-minded men and women for a common vision. 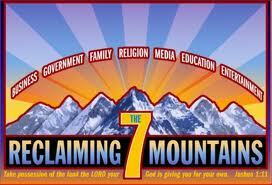 The 7 mountains initiative is not an initiative to establish dominion over all the earth or in governments. It is not an initiative that does not love and serve all people on the earth or seeks to alleviate other faith expressions. As followers of Christ, we believe we are called to love all people, regardless of faith, lifestyle or gender orientation. God loves all people. He provides guidelines for living as found in the Holy Scriptures and we support those guidelines as a people called to love and obey His calling upon our lives. Jesus invites all people into this destiny, but not all will come. We are called to model what Christ taught when He prayed that what was in heaven would be manifested on earth through a people known for their love of one another and others. That means His love and grace would be extended to all people.